I am a fairly simple person and sometimes all it takes is a persimmon and some sunlight to help me get my priorities to order. I have never been one to sit down for a hearty breakfast. I start my day with a cup of coffee and take my breakfast on the run, most of the time in a jar, if at all. But one busy weekend morning as I hustled about the house in that seasonal whirlwind of to-do’s, I happened to catch a random ray of sunlight playing with persimmons on the countertop. Such little things entrance me like a child and often give me cause to pause and insert a little me-time. So, I shifted gears, slowed the pace, changed direction and idled a while in the kitchen. I found myself suddenly craving that cozy comfort of a lazy day, curled up on the couch with a warm bowl of oatmeal and a good book. Although I was fancying oatmeal at the time, I opted for quinoa instead. 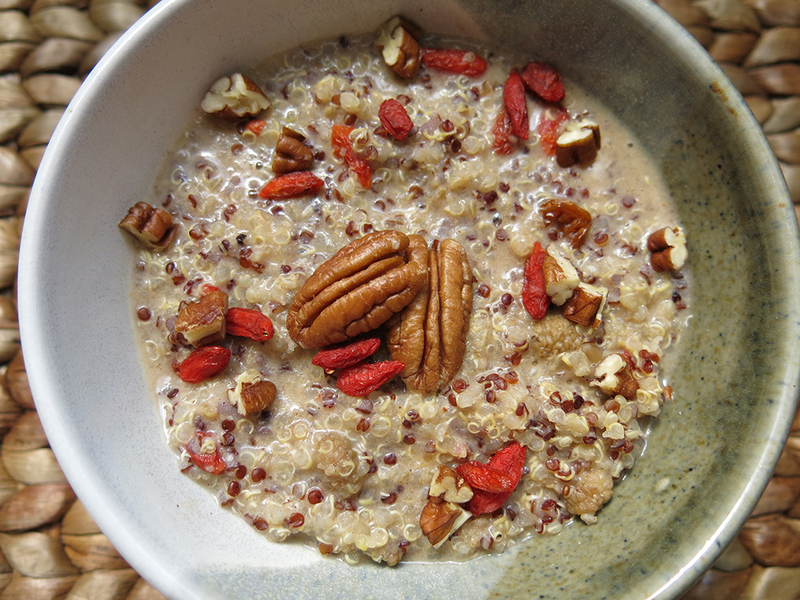 These quinoa flakes are nutrient-dense and satisfying, but I find them a little lighter than oats. Plus, they are quite quick to cook. 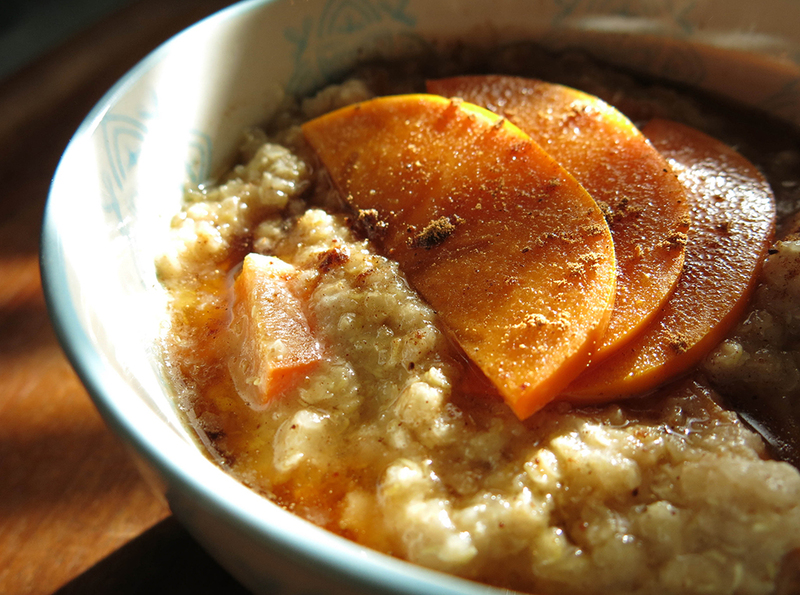 So, I put a pot on the stove, warmed up some milk and prepared a bowl of warm porridge to enjoy with my persimmons and a little pumpkin spice. Then I promptly proceeded to the couch to cozy up with a blanket, a book, a ray of sunlight and a warm bowl of comfort. It only required a little time out to create a lasting lazy sensation that followed me through the rest of the day as I continued on with the To-Do’s and the Need-You’s. And as it turned out, those happened to be the last of the organic persimmons for the season. In retrospect I am glad I slowed down, took that turn and lingered awhile with my seasonal friends, for they have moved on now and it was a sweet farewell. Heat almond milk in a pot until it just begins to boil. 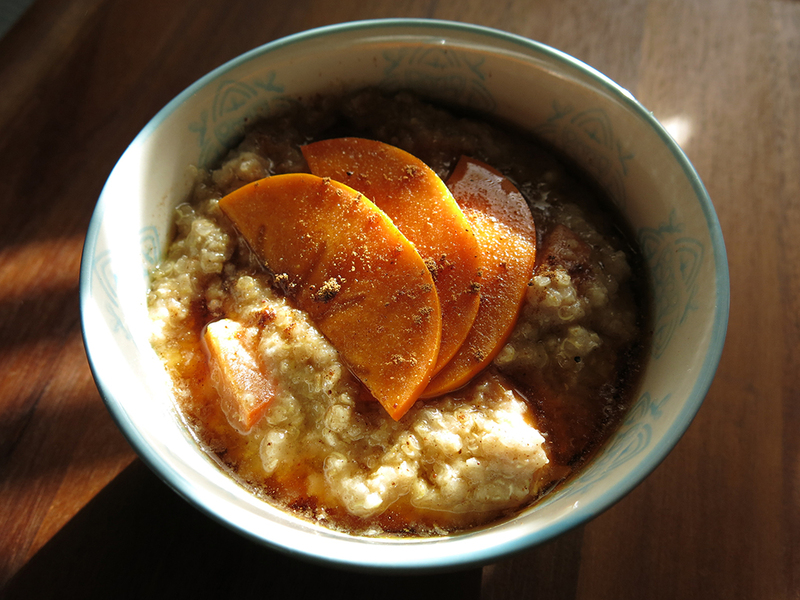 Add quinoa flakes, spices, maple syrup and diced persimmon. 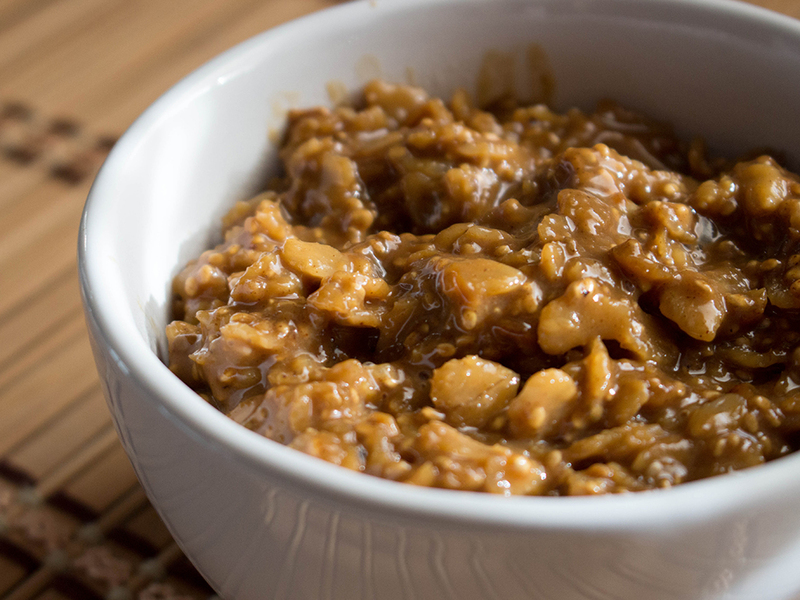 Stir frequently for about 1 minute, remove from heat and allow to sit for a few minutes before serving (the cereal will thicken slightly as it sits). Serve in your favorite bowl topped with persimmon slices, a dash of cinnamon or pumpkin spice and a drizzle of maple syrup. *This recipe makes one serving. You can easily alter the consistency to your liking by adjusting the amount of milk. That simple bowl of porridge started a little string of warm cereal mornings in an attempt to recreate that lazy day experience. The next time it was leftover quinoa and pecans. 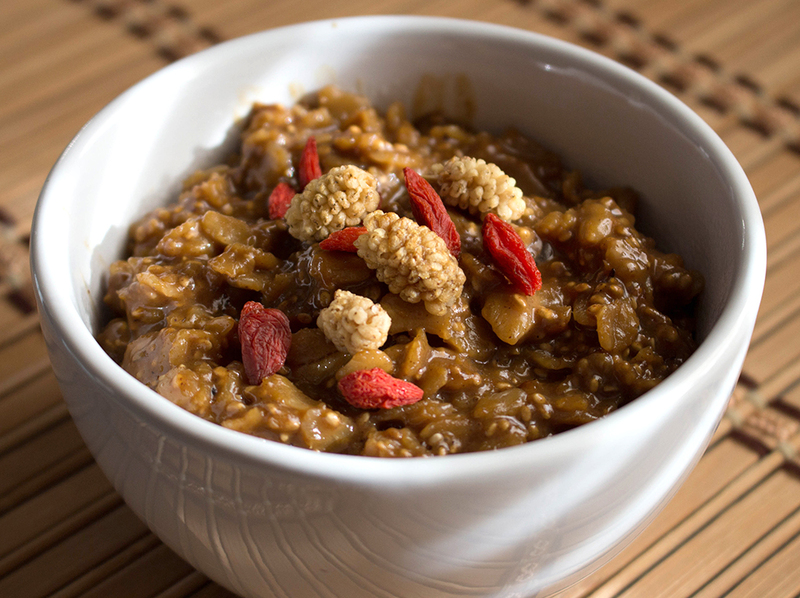 I Simply heated a cup and a half of milk on the stove, added a cup or so of leftover quinoa, a tablespoon of maple syrup, a teaspoon of cinnamon and a handful of my favorite superberry trio (dried mulberries, golden berries and goji berries). If you pause to give yourself a few moments with a simple bowl of cereal, perhaps that cozy comfort will accompany as you go dashing through your day. I often enjoy eating breakfast for dessert, but one silly little thing I love about the holiday season is having an excuse to eat dessert for breakfast. 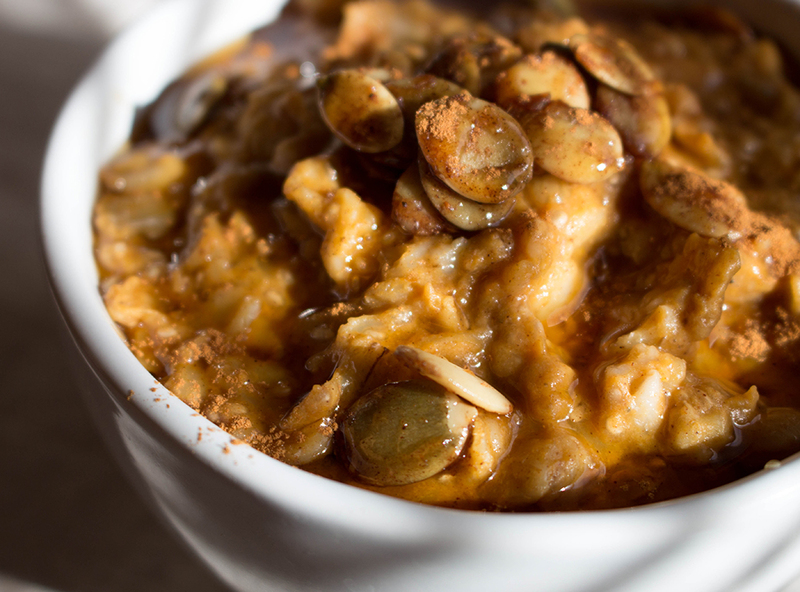 My next cozy comfort bowl took a decadent turn, inspired by left-over pumpkin pie. I love pumpkin pie and it suddenly occurred to me that there is absolutely no reason I cannot indulge in my favorite dessert for breakfast any day, holiday season or not. This bowl of pumpkin-spiced comfort is delicious enough on its own and unadorned, but in the spirit of indulgence and dessert for breakfast, I topped it with a generous drizzle of maple syrup and a handful of candied pepitas. Heat almond milk in a pot until it begins to boil. Add oats, chia seed, pumpkin puree, maple syrup and pumpkin pie spice. Stir, reduce heat and simmer 10-15 minutes. Serve plain or top with pumpkin seeds, a dash of cinnamon and a generous drizzle of maple syrup. After pumpkin pie, the next logical step in my cycle of seasonal flavors was gingerbread, of course. Because at this time of the year, gingerbread spice makes everything nice, does it not? 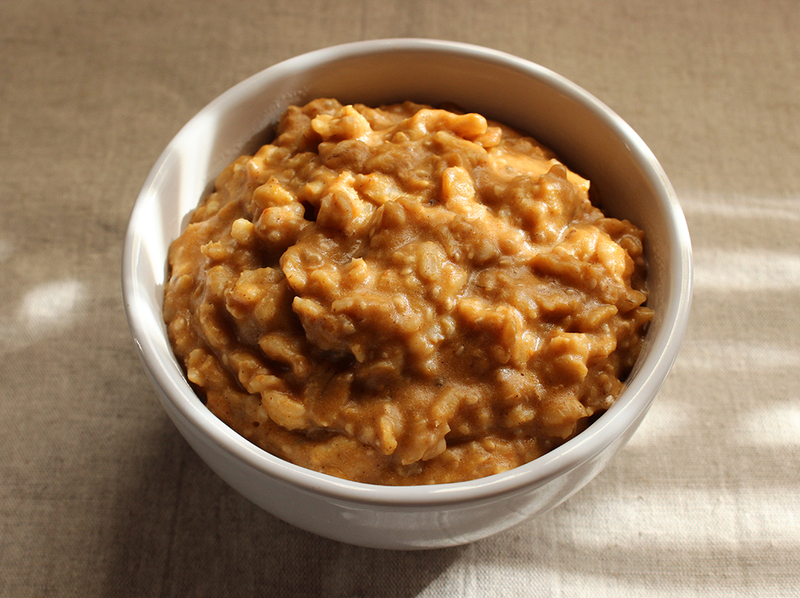 I used my recipe for Pumpkin Pie Oatmeal, simply omitting the pumpkin puree, replacing the pumpkin pie spice with gingerbread spice and adding a tablespoon of molasses. 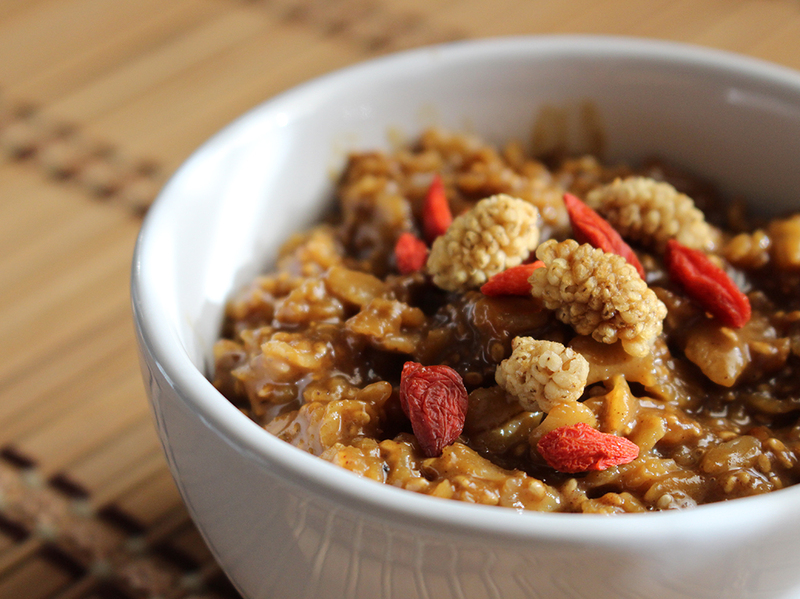 Again, this dessert-like oatmeal is delicious just as it is, but you can certainly dress it up with your favorite festive adornments. Combine spices in a small bowl and transfer to a spice jar. Store in your spice cupboard for future lazy days with gingerbread for breakfast. It may be simple, perhaps a bit silly, but in the midst of your hectic holiday schedule, when you begin to feel overstretched and overwhelmed, remember that sometimes the simplest of things, like a little time-out, a moment of sunlight or a warm bowl of comfort, can slow the pace long enough for you to catch your breath, heed the tidings and enjoy the spirit of the season.